Editor’s Note: In November 1990, George W. Hunt, S.J., editor in chief, wrote a glowing Of Many Things column to mark the 75th birthday of Frank Sinatra. The singer responded with his “sincere thanks.” This article has been republished as part of America’s special 110th anniversary issue. In the spirit of Ecclesiasticus (44:1), let us now praise famous men: specifically Frank Sinatra. In that same spirit, for the nonce let us overlook the many wives and extras, the coarser encounters, the shifting politics, the bad companions, the superannuated hipster slang, the mean vendettas, the many tacky movies. Instead, with W. B. Yeats, we celebrate not perfection of the life, but perfection of the work—that of the greatest popular singer of our century. Francis Albert Sinatra (so named, instead of Martin Jr., because of the priest’s confusion at his baptism) will be 75 years old on Dec. 12, 1990. The occasion has prompted a reissue of his finest albums by Columbia, Capitol and Reprise records and the start of a “diamond anniversary” tour. Not bad for a boy from Hoboken, N.J., who can’t read music and whose image as legislator of sumptuary laws has mutated from bow-tie and wide-shouldered suits to the snap-brim hat, loose tie and coat tossed casually on shoulder and on to the tuxedo-clad, cuff-showing Chairman of the Board of today. 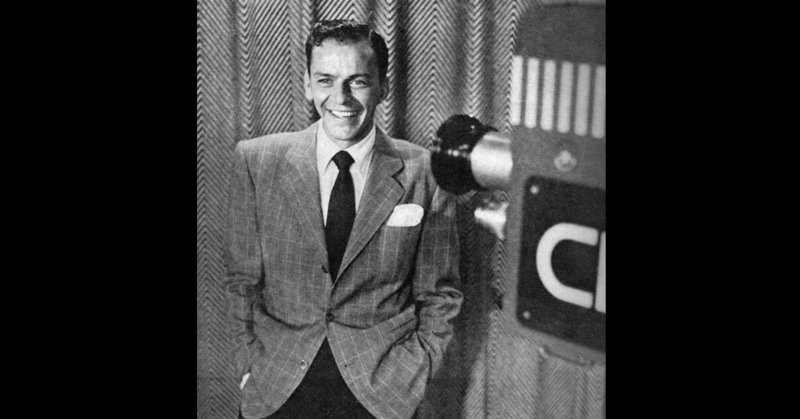 No other singer has three-hour programs throughout the United States devoted entirely to his music; on a Sunday, for example, one can drive from Boston to Washington, D.C., and lap each mile with Sinatra along. I know because I have done so countless times, and, like other aficionados, I never tire of the treat. In fact, I can honestly say that no other stranger has provided so much continual and renewable pleasure in my life as has he. That said, it remains difficult to describe to non-enthusiasts why Ol’ Blue Eyes is so special, although John Rockwell, the music critic for The New York Times, in his book Sinatra: An American Classic (Random House-Rolling Stone), has succeeded best. But let us give it a try. 2) Sinatra’s musical phrasing is unique in its smoothness, sense of nuance and expressiveness. He admired Bing Crosby immensely, but he decided to try something different; as he said, “I wanted a certain type of voice phrasing without taking a breath at the end of a line or phrase.” He listened to the violin-playing of Jascha Heifetz, noting how he moved his bow back and forth without seeming to pause, and he watched Tommy Dorsey’s breath-control at the trombone. To personalize these techniques, he swam underwater and paced himself while running to increase lung power. The result: an ability to sustain a legato line, to sing six or even eight bars without a visible or audible breath. 3) His extraordinary care for the song’s lyrics and his near-perfect diction (where the hard “d” and “t” consonants are effortlessly articulated) also make Sinatra unique. As a young man, he would always write out the lyrics long-hand to better concentrate on the words and shapes of phrases sans musical distraction. This fastidiousness, coupled with his innate acting talent, made each song a dramatic, intensely personal performance. Few singers so identify themselves with the song’s lyrics (and story and setting) and so expose their “personal” feelings (whether jauntily and happy or vulnerably sad) as does he, and none so defiantly challenges us to listen with a reciprocal intimacy. One could go on about his remarkable musicianship, the conversational naturalness of his singing, his dedication to the best in the pop tradition, but I hear you interrupt: What are your Sinatra favorites? As for individual songs, there are far too many to enumerate, but as for albums I lean toward “Songs for Young Lovers” (Capitol, 1954) and “Songs for Swingin’ Lovers” (Capitol, 1956). Sinatra’s own favorite album: “Only the Lonely” (Capitol, 1958). A good friend of mine brought to my attention your “Of Many Things” column (11/24). I want you to know I thoroughly enjoyed the column, and I especially want to thank you for your many kind and wonderful words. I was deeply touched that you took the time to write this lovely tribute in honor of my 75th birthday, and it truly made my day a very special one! Appreciate your love and support. With all good wishes for the New Year, Father, and my sincere thanks again. Editor’s Note: In February 1948, J. Edgar Hoover, the first director of the Federal Bureau of Investigation, wrote to America about his position on “loyalty tests” for federal employees. I have read with considerable interest the article entitled “Loyalty tests for Federal employes,” which appeared in the January 17, 1948 issue of America, and I wanted you to know that the conclusions it reached represent the position which I took when I appeared before the Loyalty Review Board on December 4, 1947. When I appeared before the Loyalty Board and outlined the various problems with which the FBI was confronted under the Federal Employe Loyalty Program, I specifically emphasized that it was not the function of this Bureau to “make charges” against any governmental employe but it was our function to investigate charges and allegations made by other persons. I pointed out that the FBI is a fact-finding agency; that it is not our function to “clear” or convict anyone; that we do not draw any conclusions from or make any recommendations upon the information which we develop during the course of our inquiries. I explained that it is the function of the FBI merely to gather the facts and present them in report form to the agency for whom the employe works. I pointed this out very clearly to the members of the board because I feared that some of them might have the same impression which a portion of the public has, namely that the FBI is investigator, jury, prosecutor and judge in this project, which, of course, is absolutely untrue. I then explained to the Loyalty Review Board that this Bureau could pursue one of two courses so far as identifying informants is concerned in handling loyalty investigations in accordance with the provisions of Executive Order 9835. I stated that there are many persons who come to this Bureau with information but impose upon the Bureau the requirement of not disclosing their identities; that many of these persons are professional men of good standing who are sincere and honest but who do not wish to become involved in any public hearings or examinations. I stated further that there are certain sources of information employed by the Bureau whose identities the Bureau would be precluded from disclosing because to do so might imperil the overall problem of security of the country. The Bureau, upon interviewing any person incident to the loyalty program could first state to such an individual that anything he might say would have to be reduced to writing and sworn to and that that person should be prepared to publicly testify at a loyalty hearing, and unless such a person was willing to meet these conditions the Bureau was precluded from taking any information from that person. I then pointed out that the other alternative would be to incorporate in report form all information received by the Bureau from all sources, indicating those who were willing to be identified and, in those instances where a person interviewed did not desire to be so identified, to evaluate the reliability of the informant whose identity would remain anonymous. I told the members of the Loyalty Board that whichever alternative they decided to follow would be entirely agreeable to the Federal Bureau of Investigation. The result was that the Loyalty Board adopted the second alternative, namely, having the Bureau incorporate all information from all sources in its reports in the loyalty cases, indicating those sources that were willing to be identified and evaluating those sources as to reliability who wished to remain anonymous. This seems to me in no way to place the Bureau in the category of a “secret police” or “Gestapo” or an organization which makes the charges and brings in the conviction. Editor’s note: These letters have been republished as part of America’s special 110th anniversary issue. This article also appeared in print, under the headline "Reader Comments," in the April 15, 2019 issue.